I’ve been meaning to do this for AGES, and have finally found the time needed. 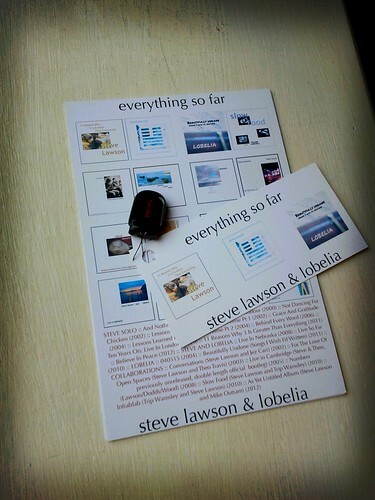 If you order the Entire Steve Lawson and Lobelia catalog on USB Stick (currently sat at 20 albums), it now comes with a lil’ label telling you what it is, and a postcard with a list of all the albums on it! Just like in the picture. As you can see, the USB sticks we’re using at the moment are tiny. REALLY really small. V. cute. 4gb of music and video. I’ve been thinking about this ‘model‘ for a while, and one thing that’s struck me is that it’s pretty rare for a relatively unknown artist (like me) to have this size of back catalog. There are certain niche scenes that have always been indie where it’s somewhat usual for people to make loads of recordings (the free improv scene, for example), but for the most part, the ‘right’ to make loads of music was conferred on musicians by the industry as a ‘reward’ for success. So, anyway, I was wondering what I could do to help out, and it struck me that it might be useful to some of you to have some extra music to put on your USB Stick. So, from today, there’s a new license for Grace And Gratitude – if you’re selling a USB Stick (or other external storage thing – CF/MicroSD etc.) with your music on it, and have AT LEAST two other albums on the stick, you can put Grace And Gratitude on there too, as part of the package. The whole album. If you’ve got it already, you can use that, or if you want to download it from Bandcamp, you can do that too. All you need to do is to make sure that on the PDF you put on the USB stick explaining what’s on it, tell your listeners where they can get the rest of my stuff. You can put it on in any format, but it has to be the whole album. If you want to do anything else with it, talk to me. This license is just for this one kind of use. Who knows, maybe a few other people will want to share their work in the same way, and we can help people who want to bolster the value of their smaller catalogs to sell some stuff at gigs! I chose Grace And Gratitude because it’s probably my most successful album thus far. It’s one that consistently crops up as lots of people’s favourite album of mine. Please have a listen to it first! 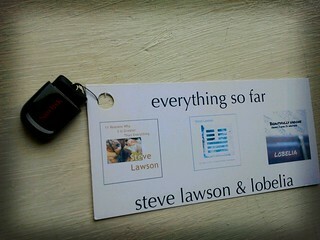 It will do you no favours putting music you don’t actually like on a USB stick to sell. If you dig it, please, go make some money from it this way. If you don’t, take the idea and do a swap with someone whose music you do actually like. Brilliant idea! And extremely generous. This is the kind of idea that inspires more ideas. Well done. Seems to me there could be a larger idea underneath this. Is it possible to curate a community of artists who all agree to make a release (or several) available to other artists to sell “bundled” in this way? Part of the agreement is that in order to use someone else’s music in your bundle, you have to have at least one release available for others to use in theirs. I think Bandcamp and a “special” license is all the fulfillment requirements needed. All thats needed above that is a place where participating musicians can publicly identify themselves as part of the program, and be “found” by other bundlers. As always, you get the wheels turning, Steve. A USB bundle for £25 of HoC, her EPs, some demos and fun stuff plus a copy of G&G, Fire Lives by Miriam Jones ( http://www.miriamjones.com/ – also great so buy that too!) and an early album by Theo Travis ( http://www.theotravis.com/ – not checked out his solo stuff but his album with Steve’s pretty darned good). Like Jeff says it would need a little collective to come together and collaborate on putting together a bundle all could sell at their own gigs. But isn’t that just the kind of thing you’ve been talking about for ages, Steve? Perhaps only a percentage of the audience at a gig would be “brave” enough to take the “risk” on finding some new great music but enough probably would to make it worth a go. Interesting! I think there are lots of directions this can head in – apparently, according to twitter, there are already a number of situations where bands have formed collectives and are selling compilations on their bandcamp pages, where whoever sells it gets the money. Good idea. I think it can probably manifest itself in myriad ways, and a lot depends on the network that the artist exists within, what they know of their audience, how many gigs they do, etc. etc. I though all usb memory sticks were small. Never seen a big one. What I have seen was what was almost like a sony memory stick, that fitted into a usb slot. But too likely to get lost. Looking ahead. Are these usb 3 memory sticks? A single track from a group a waste of time and space. Always whole albums. I was thoroughly pissed off when I found The Church Of The Good Thief had only one playable track. At first I thought something wrong with the player. An abuse of bandcamp methinks. I’m not sure where you get this idea that things are an ‘abuse of bandcamp’ – there are certainly things people do that I think are disadvantageous to the discovery of their music, but to suggest that constitutes abuse of the service is a pretty hefty leap of logic. Likewise the idea that single tracks are a waste of time and space. It may be that you are only interested in whole albums. In which case, feel free to bypass the things that aren’t of interest. I tend to be an album listener too, but am more than happy to take single track recommendations from people as a launch pad from which to investigate further. And, if you look at the bandcamp player stats, the vast majority of people play one or at most two tunes before making a decision whether to download/buy the music or not. The number of complete plays of entire albums via the embedded players is relatively small. These are without doubt the smallest USB flash drives I’ve ever come across – part of the reason why we’ve attached a label to them. And as far as I’m aware, they are USB2. The idea being to get large volumes of music to people as easily as possible. We’ll soon be doing a FLAC version too. Which will probably be on an 8Gb drive.